Happy Hump Day! It is the Your Next Stamp DT Dare and we are feeling blue. Shades of blue is this months theme and the team did not disappoint in sharing their fab creations using the color blue. For my card, I decided to use some watercolor paper and Distress Inks to create the background. The image was stamped using the new Sea Friends set and coordinating dies in the YNS Stone Gray ink. I popped up the image over the background and added some fun trim to the bottom. 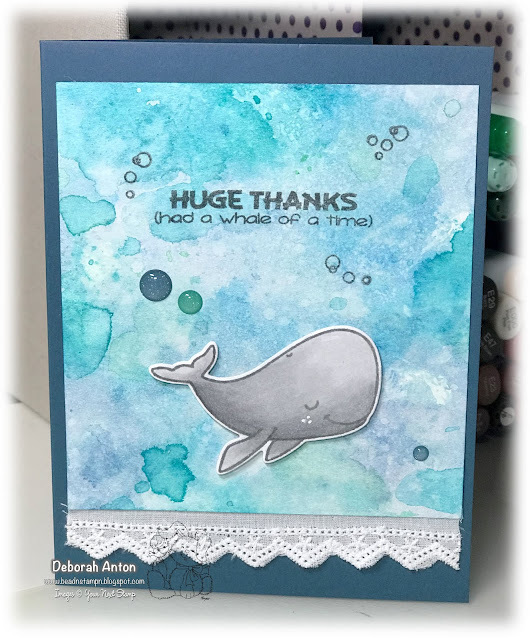 The card was finished with a few bubbles stamped from the same set and some of the new Seas the Day gumdrops. Be sure to stop by the YNS Blog to see all the fun creations the DT have made and to leave a little love. You can have a chance at winning a stamp set of your choice! Thanks for stopping by and hope you have a great week!